The Vancouver Condo Buzz » 58 HOMES FOR SALE at Marquee on The Drive Vancouver Apartments > Boutique, Energy Efficient and Affordable Vancouver Condos! 58 HOMES FOR SALE at Marquee on The Drive Vancouver Apartments > Boutique, Energy Efficient and Affordable Vancouver Condos! Live at the heart of the Drive in East Vancouver soon! The grand opening launch at the Vancouver Marquee on the Drive apartments is now here at 2250 Commercial Drive Vancouver East. Here you will find a mixed use project that will offer 58 concrete homes including studios, 1 and 2 bedroom floor plans plus funky lofts. The Marquee on the Drive Vancouver apartments are located in one of the city’s most eclectic yet exciting neighbourhood and with prices starting from the mid $300’s, this is an affordable opportunity for first time buyers! It’s pretty simple: when you find where you’re meant to be, it’s like everything falls into place. And life starts moving forward. 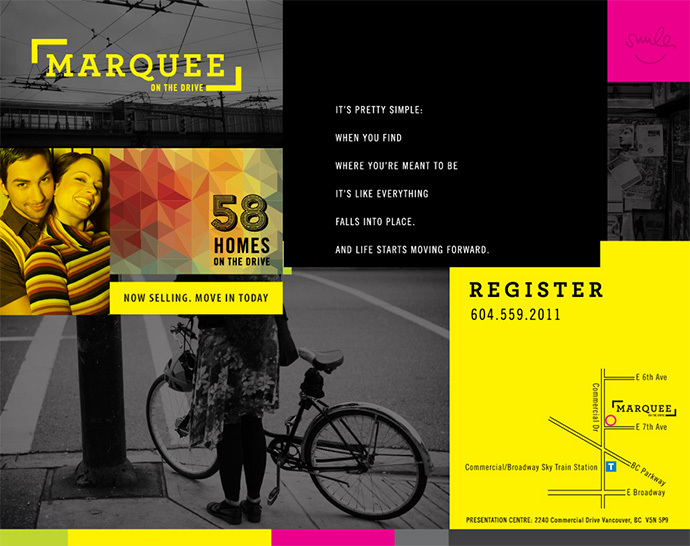 58 boutique condominium residences are available on the Drive at Marquee Vancouver condos. Plus, you can move in today! Visit www.lifeonthedrive.ca for all the details. The presale Vancouver Marquee on the Drive condos are brought to you by boutique builder Ankenman Marchand Architects and Image Development Inc. The project will be a five storey low-rise building with an emphasis on reducing your environmental footprint. The Marquee Vancouver apartment building also preserved over 75% of the existing walls, roof and flooring while improving the energy efficiency of the building by nearly 40%. The project is completed and designed to LEED Gold equivalency. Most of the homes here at the presale Vancouver Marquee on the Drive apartments will have large entertainment patios/decks with stunning views in addition to spacious floor plans and brick/steel structure with thick concrete floors that give home owners extra soundproofing not seen in other new developments. Barbara Smyth interior designer chose the exceptional finishes for these boutique residences. While extending the architects vision for the homes, Barbara Smyth carefully selected features that would complement the open floor plans, over height ceilings and very large windows. By maximizing your space and views, the new Vancouver Marquee on the Drive condos feature lots of natural light, one inch quartz counters, chef inspired kitchens with stainless steel high-end appliances and two tone designer cabinets with whisper quality soft close hardware. In addition, the main living spaces of these new homes will have contemporary plank laminate wood floors and oversized tiled floors in the bathrooms. You can visit the presentation centre for the Marquee on the Drive Vancouver East apartments at 2240 Commercial Drive Vancouver. The project site is located just next door at 2250 Commercial Drive. Home owners will also be just steps away from the Commercial/Broadway SkyTrain Station networks, BC Parkway and all that the Commercial Drive district has to offer year round. Please note that this new offering features both one level traditional floor plans in addition to two storey boutique penthouse suite layouts! There are 2 colour schemes to choose from that include Red Carpet and Silver Screen (we love the names!) and the generous floor plans will maximize both views as well as natural light. The new Marquee Vancouver apartments will also feature modern NuHeat mats in the bathrooms, oversized tiled floors and elegant euro-style plank laminate wood floors in all suites. Also available are decorative electric fireplaces in some homes and individually controlled baseboard heating system. The windows are double glazed and low-E and the penthouses will have extra large 17 foot floor to ceiling windows (in some homes). The outdoor decks and generous balconies extend your living space outward and there are hose bib and gas connections for your convenience. The Marquee on the Drive Vancouver condos are also built to LEED Gold standards with steel and concrete building structure and protective rain screen technology. There is a bright and secure underground parkade and enterphone for visitor access. All homes will also have front loading stacked washer and dryer in addition to partial sun diffusing roll down solar window shades and pre-installed P3000 multimedia TELUS box for entertainment/media. There are custom closet organizers in addition to storage spaces. 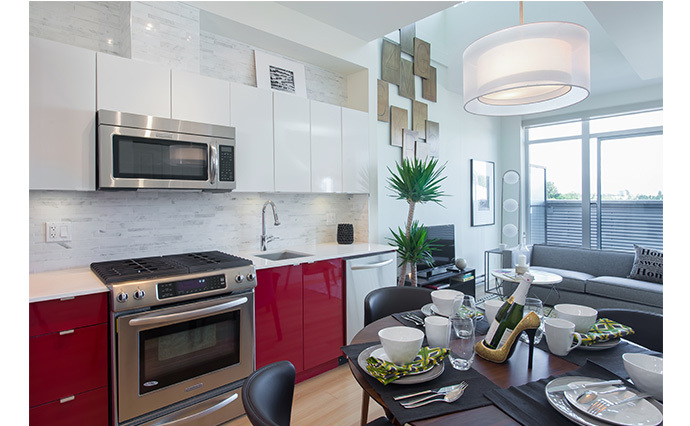 The new Vancouver Marquee apartments will also have gourmet kitchens complete with KitchenAid slide in gas range, stainless steel dishwasher and Fisher & Paykel or Jenn-Air built in fridge all of which are Energy Star rated. There is under cabinet lighting and two toned designer cabinetry (with soft close technology). There is also a square under mount double bowl stainless steel sink and over the range microwave. The building will also feature a fitness room in addition to electric car charging stations in the underground parkade. The Vancouver Marquee on the Drive apartments will also feature a car share program with two community cars. The amazing location on The Drive in East Vancouver also features a walkable neighbourhood close to the Commercial/Broadway SkyTrain station, downtown Vancouver, schools, recreation, services, parks and other great activities. The building is situated to maximize your views of the North Shore Mountains and/or downtown Vancouver too. Filled with colour, character and style, The Drive Vancouver is all about enjoying life to the fullest and enjoying the buzz and vibrancy that surround you. These move-in read homes at the Marquee on the Drive Vancouver apartments include traditional one-level condominium residences as well as amazing two storey loft homes. Here, you’ll find cathedra style ceiling heights of up to 17 feet, allowing tonnes of afternoon sun into your spacious living rooms. The loft style bedroom above is very funky and appropriate for this location. The linear kitchen with marble backsplash, high gloss white upper cabinetry and integrated appliances with charcoal exotic wood pattern is simply stunning too. Large outdoor spaces that can fit a fire pit, lounge area, dining table and chaise lounge chairs are exceptional. The Drive Marquee Vancouver apartments will also have incredible views. This is brilliant living. Move in Summer 2014. 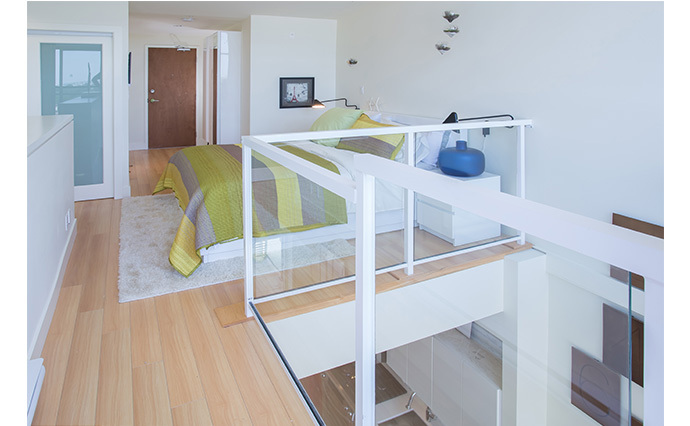 Steps from Commercial/Broadway SkyTrain Station! Exclusive preview event starts on May 24th! 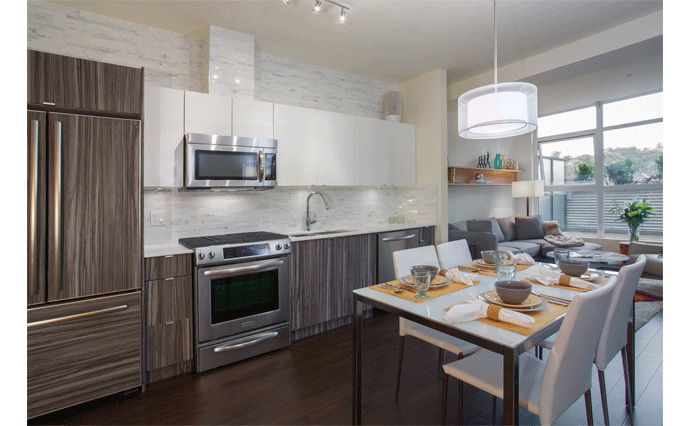 The Marquee Vancouver apartments start from the low $300’s. It’s pretty simple: when you find where you’re meant to be it’s like everything falls into place and life starts moving forward. The presentation centre and display homes are located at 2240 Commercial Drive Vancouver and they are open noon to 5pm daily except Friday. The homes are priced from $315,900 for move-in ready residences. The history of the new Vancouver Marquee on the Drive apartments is truly unique as the building was originally the Van East Cinema and some commercial and retail outlets. The building was re-purposed using the existing solid street and concrete structure to build the new Vancouver Marquee apartments that are built to LEED Gold standards. The homes have over height nine foot ceilings!